This section provides information and links to music educators and administrators. Robbin Marcus is Kodály program director at George Mason University and was a Kodály course faculty member at Webster University and the American Kodály Institute as well as an ATI-certified Alexander Technique teacher. Robbin was the Elementary Music Specialist at St. Paul’s School in Baltimore, Maryland for 25 years. She founded and directed elementary ensembles in choir and in lap dulcimer. The Lower School Choral Ensemble performed under her direction at Meyerhoff Symphony Hall with the Concert Artists of Baltimore and at the White House, as well as at numerous conferences and events. Robbin has presented hundreds of workshop sessions on Folk Dance and on the Kodály Method of music education at conferences and chapter workshops across the United States. 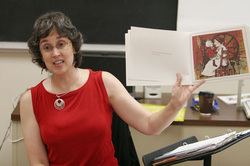 She is a frequent presenter for the Organization of American Kodály Educators (OAKE) and was chair of the Music Teacher Training Track sessions on Materials from 2007-2010. Robbin was Family Week Program Director for the Country Dance and Song Society at Pinewoods Camp, and has taught multi-age children’s classes on dance and song at family camps.